WASHINGTON D.C., November 15, 2018—The first-ever U.S. Access to Nutrition Index reveals that the 10 largest U.S. food and beverage manufacturers lack the policies and action needed to tackle the high levels of obesity and diet-related diseases in the United States and ensure consumers have access to affordable, healthy products. The companies are not doing enough to improve the nutritional quality, pricing and distribution of their products nor to improve their practices related to responsible and transparent product marketing and labeling. 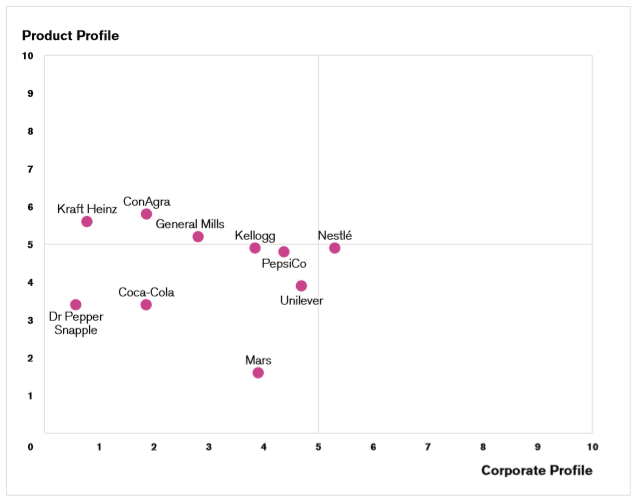 The Index’s ranking of the 10 companies has Nestlé leading the Corporate Profile with a score of 5.3 out of 10 for being the most transparent about its progress to help consumers eat healthier through commitments focused on making its product portfolio healthier, better informing consumers, more responsible marketing activities and other efforts. Unilever came in second place and PepsiCo in third. ConAgra leads the Product Profile with a score of 5.8 out of 10 for carrying the healthiest product portfolio, followed by Kraft Heinz in second place and General Mills in third. Based on their total U.S. sales in 2016, the 10 companies included in the Index are Coca-Cola, ConAgra, Dr Pepper Snapple, General Mills, Kellogg, Kraft Heinz, Mars, Nestlé, PepsiCo and Unilever. • A number of companies have demonstrated leading practices which all companies should follow including clear reporting on nutrition strategy and how it relates to overall business strategy (Nestlé); disclosure of progress against reformulation targets (Unilever); compliance audits on marketing policy (Mars) and a commitment not to market in K-12 schools (General Mills and Kraft Heinz). • Companies have implemented some reformulation efforts, but less than one-third of the companies’ products can be classified as healthy according to independent nutrition criteria. Additionally, only about one-fifth of the companies’ combined sales were estimated to be generated by healthy products and only 14 percent of the companies’ products met nutrition criteria for marketing to children. Note to graph: higher scores indicate better performance for Corporate and Product Profile scores. A comparison of the results of the U.S. Spotlight Index and the 2018 Global Access to Nutrition Index shows that the nine food and beverage companies included in both Indexes are less transparent about their efforts in the U.S. than globally. The companies do not do enough to make healthy products more affordable and accessible, nor have they adopted interpretive Front-of-Pack labeling in the United States particularly compared to their efforts to do so in other parts of the world. The 2018 Index report calls on companies to improve the nutritional quality of their products, particularly established, high-sales volume products and ensure those products are more accessible and affordable to all consumers. They should also increase their efforts to market more responsibly with a focus on promoting healthier products. The U.S. Access to Nutrition Index was funded by a grant from the Robert Wood Johnson Foundation. The views expressed in this report do not necessarily reflect the views of the Foundation. The Access to Nutrition Foundation is an independent, not-for-profit organization. It publishes consistent, standardized analysis and commentary on food and beverage manufacturers’ efforts to improve consumers’ access to nutritious foods and beverages, both globally and in Spotlight countries. Additionally, ATNF collaborates with the investment community to ensure the Indexes are a useful tool as they engage with and invest in food and beverage companies.